The city of London is unique, even in a city with as diverse a history as the UK capital. The location from which London was essentially established and grew to become the metropolis it is today, the City, also known as the Square Mile, is now the world’s leading financial centre. The best estimates put the establishment of the city of London at around 50 AD. This was seven years after the Romans had invaded Britain and seeking to create a focal point for their rule. They built a wall to contain the area, parts of which can still be seen in the City today. The position of the area, on the banks of the river Thames, meant it became a key trading port. Over decades and centuries, the amount of business conducted in the City grew massively. This led to the establishment of guilds to regulate different professions. The power of the guilds grew and in the 17th century some were able to secure exclusive trading rights with different parts of the world. Such strength meant that the city of London was able to resist central government control. The City retains its independence to a large degree today. 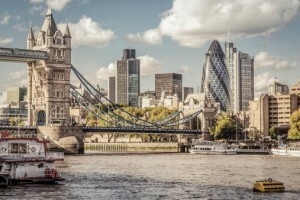 It is classified as a district rather than a borough and is administered by the City of London Corporation that, unlike other areas of London, has control over things such as policing, sewerage and collection of taxes. Residents and traders operating in the City elect the Corporation. Today, the City is undeniably the financial hub of the United Kingdom. Almost all major financial institutions have an office there, while it is also home to the Bank of England and the London Stick Exchange. The city of London is the centre of the world when it comes to forex trading. According to the Bank for International Settlements, in 2013 the City accounted for a full 41 percent of all forex transaction made across the globe. In comparison, the nearest rival was New York, with just 19 percent. The amount of forex trading that occurs in the City varies according to financial conditions across the world, but in recent years it has consistently been between 2 and 5 trillion pounds annually. The British pound was, in 2013 according to the figures of the BIS, the fourth most traded currency, while it is the third most commonly held reserve currency around the world.